By default, authenticated users may only access network resources within their current network zone, or that are allowed by any active zone bridging rules. Group bridging is the process of modifying this default security policy in order to allow authenticated users from any network zone to access specific IP addresses, IP ranges, subnets and ports within a specified network zone. Like zone bridges, group bridges can be narrow (for example, allow access to a single host, using a named port and protocol) or wide (for example, allow access to any host, using any port and protocol). It is recommended you make bridges as narrow as possible to prevent unnecessary or undesirable use. Group bridging uses the core authentication mechanism — users must be pre-authenticated before group bridging rules can be enforced by the Smoothwall System. Users can authenticate themselves using the authentication system’s login mechanism, either automatically when they try to initiate outbound web access, or manually by browsing to the secure SSL Login page. Authentication can also be provided by any other mechanism used elsewhere in the system. For more information about authentication, see About User Authentication . Group bridging rules apply additional zone communication rules to authenticated users. 1. Go to Network > Filtering > Group bridging. 2. From the Groups panel, select the user group that rule applies to. For a detailed description of how to configure user groups, see Managing Groups of Users . • Destination interface — Select the interface that the group is permitted to access. • Destination IP — Enter the destination IP (for an individual network host), IP address range (for example, 192.168.10.1-192.168.10.15), or subnet range of IP addresses (for example, 192.168.10.0/255.255.255.0 or 192.168.10.0/24) that the group is permitted to access. To allow access to any host in the destination network, leave this parameter blank. • Protocol — From the drop-down list, select a specific protocol to allow for communication between the zones or select All to allow all protocols. • Service — From the drop-down list, select the service, port or port range to be used. To restrict to a custom port, select User defined and enter a port number in the Port field. 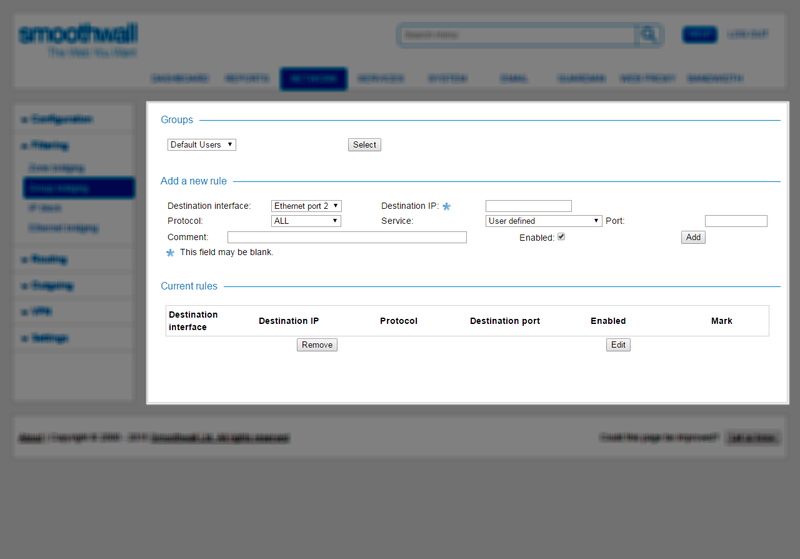 To allow any service or port to be used, select User defined and leave the Port field empty. • Port — If applicable, enter a destination port or range of ports. If this field is blank, all ports for the relevant protocol is permitted. • Comment — Enter an optional description of the rule. • Enabled — New group bridging rules are enabled by default. Clear the check box to create a disabled rule. 5. Click Add. The rule is added to the Current rules table. 2. From the Current rules panel, Mark the relevant rule. 4. Edit the configuration as required. For a detailed description of each setting, see Creating Group Bridging Rules.